G’Day Mate! Known for its teeming natural and cultural treasures, The Land Down Under has the perfect something for every type of traveler. There are so many great things to do in Australia. Relax on the gorgeous beaches along its extensive coastline; embark on an exciting adventure, like going on on a walkabout or even Great White Shark diving, or head on over to the cosmopolitan cities of Sydney and/or Melbourne to enjoy shopping, fine dining and a budding art-scene. This Australia travel guide and list of things to do will help you plan your next vacation. 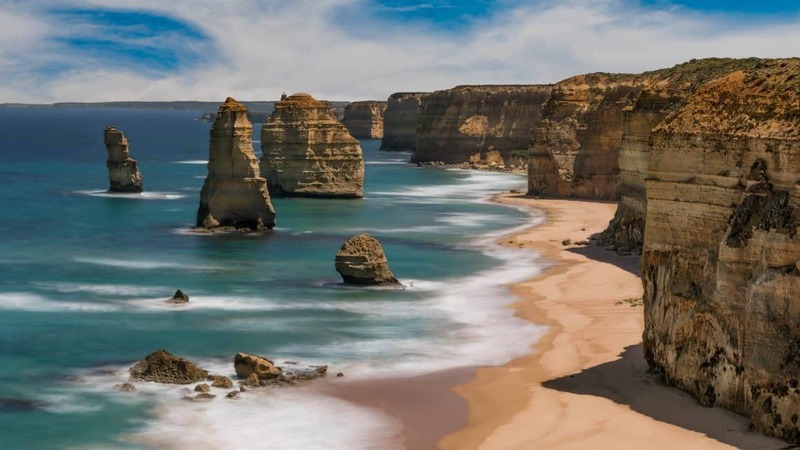 The only problem with scouring through this Australia travel guide, is that once you visit this massive island continent, you might not want to leave! Kangaroo meat can be purchased from the supermarket, butcher and is available on restaurant menus as a leaner and healthier alternative to beef or lamb with a 1-2 percent fat content. Bush fires are common in Australia from late spring to summer; during this period please observe simple safety precautions. Make sure to research risks before travelling and when camping, use only designated fireplaces, while also complying with road warning signs and fire bans. You can rent a mobile phone from such providers as RebelFone, Vodafone Rental, Landwide and Cellhire. In general, if you do not already have a GSM phone, it is less expensive to rent a phone for short stays. Fun Fact: Australia's former Prime Minister held the Guinness World Record for beer chugging. Due to the sheer size of the continent, weather in Australia varies significantly depending on where you want to travel. Northern states experience warm weather year round while the southern states experience cooler winters. Australia is also one of the driest continents on the earth with an average annual rainfall of less than 600 millimetres. Remember that Australia's seasons are opposite to those in the northern hemisphere! Pack sunscreen – Australian sun is very strong. Always wear a shirt, hat, sunglasses and SPF 30+ sunscreen lotion, even on cloudy days. Bugspray – mosquitoes and sand gnats are a nuisance that can be prevented with bug spray and a handy mosquito net. If you visit the Outback, the latter is a must-have. Ticks are also common in the wilderness and, should you be bitten, a pair of tweezers will enable you to remove the pest from your skin. Hiking Gear – for travellers heading up to the Northern Territory, consider packing hiking shoes/trainers, a hat and a water bottle. Also, pack clothes that you don't mind getting dirty (due to the red dirt of the desert) and avoid packing light colours. See our packing tips for travel for all travel gear, camera gear and clothing we pack for travel. Are you enjoying our Australia Travel Guide? Check out more tips below. Australia has reasonable weather all year round. It is a large country though, so you want to check out each place region by region. Some part of Australia are have tropical or mediterranean climates, while others are desert and temporal. Northern states are typically warm year-round with two seasons: wet or dry. Southern states have cooler winters. December to February: summer. March to May: autumn; June to August:winter; and September to November: spring. We always suggest traveling during shoulder season for cheaper prices and less crowds. Queensland is split up between two climates the Tropical North and Temporal Queensland. Wet season is hot and humid and you can expect tropical thunderstorms and even hurricanes. That said, we travelled to Queensland in Feb and had mostly sunny skies with just short, intense rains each day. Dry season is still hot but there is less humidity: 28 degrees celcius, (84 farenheit) but nights are cooler. Swimming is better at this time of year with less chance of crocodiles and jellyfish. Crowds are much worse and rates are higher. So it is a trade off. This is the driest state in the country and it is very large. Sydney typically sees 340 sunny days a year, so you can't go wrong anytime. Melbourne possibly has the most changeable weather in Australia. March – May is the best time to visit with a lot of festivals going on. It's shoulder season right after summer. Sept – Nov are second best. Temperatures are more moderate at these times of year. Dec-Feb is summer and is peak season in Victoria. Temperatures are hot and crowds are dense. Imagine having to jockey for a position to see the twelve apostles. That said, we visited Victoria in January and by doing the Great Ocean Walk, we avoided all crowds as we hiked the coast for four days. Go during shoulder season and you'll be happier. June – August – unlike other cities in Australia – Melbourne is cold and dreary during the winter months. Winter can fall below freezing at night and summer can go above 100 degrees farenheit. Australia is a very stable country, there are few risks for personal safety if you follow common sense and stay aware. Sun is the biggest factor for safety. Drink plenty of fluids, wear sunscreen or sun hats and stay covered up. Beaches have a lot of rips and currents so always swim between the flags so life guards can see you. Swimming on the beaches of Tropical Queensland can have a risk of Crocodiles Talk to locals and follow the signs. Avoid swimming at mouths of rivers where crocodiles like to hang out. When driving through the outback make sure your vehicle is in good shape and have extra food and water. Take a Helicopter Ride over the Great Barrier Reef – A flight over the reef gives you the opportunity to appreciate just how massive this system is. Paddle Board in the Oldest Rainforest on Earth – What better way to spend an afternoon than a lazy float along the river? Take Flight on a Hot Air Balloon – Step back in time and fly high in the sky as you take in sunrise over the Gold Coast. As you fly over farmland and wide open spaces you’ll spy kangaroos and finish off with a champagne breakfast at a local vineyard. Attend Hollywood Stunt Academy – The academy is run by martial arts expert Colin Handley. He caught the eye of Chuck Norris and was invited to Hollywood to work as a stuntman. After working on over 100 TV and movie projects he came back to Australia and opened his very own Stunt Academy! Go White Water Rafting – Just 20 minutes outside of Cairns is the Barron River, where travellers can go on quite the white water rafting experience. Swim with some Great Whites – jump into the water with some of the most magestical creatures of the ocean world. Take a Dolphin Swim in Shark Country – get up close and personal with the dolphins of Baird Bay, but don't stray to far from the guide! Take the Ultimate Scuba Adventure – explore this underwater paradise by joining one of the many dive expeditions that explore the reef system on a daily basis. From snorkeling near the safety of a pontoon on the inner reefs to extreme exposed ocean diving out at Osprey Reef, there’s something for everyone to enjoy. Go on a Walkabout – Learn about the culture and traditions of the Kuku Yalanji people as you walk through the world’s oldest rainforest, the Daintree Rainforest of Queensland, Australia. DYI Winemaking – A tour through Barossa valley will take you through a gorgeous countryside to visit wineries such as Wolf Blass, Lehmanns and the Penfolds just to name a few. Stop for a taste test at Penfolds and why not try to blend your own wine? Go for a Bike Ride Along the Gold Coast – this area of sandy beach stretches for miles, so why not rent a bike and explore the area. Escape Civilisation – Australians rave about Maria Island. Located off the Tasmania's east coast, the beautiful island has something to offer everyone from sweeping bays to isolated beaches and quiet lagoons, it is an unspoiled gem. Have a Wildlife Encounter on Kangaroo Island – take a safari tour through Kangaroo Island – spot most of the wildlife that makes Australia so unique, visit the most beautiful beach in all of Australia (Vivonne Beach) and explore some the island's many wildlife sanctuaries. Fly to Flinders to Witness Wilpena Pound – enjoy the beauty of Wilpena Pound, a giant amphitheatre of raised rock circling through 80 square kilometres of the Flinders Ranges.